i can’t wait for all the pedantic web purists to start whining about “accessibility” and html validation – who gives a crap when the end product is that good? First, I’ll say this site is awesome. Also, in response to joe’s comment, accessibility does matter if a portion of your expected audience requires it. Designing a site for a public organization, such as a library or school? You’d better believe accessibility is important. 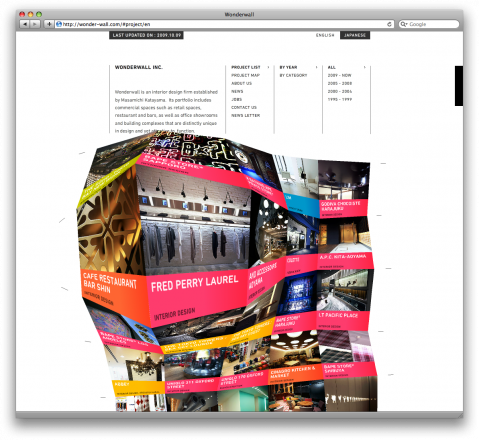 But designing a site that is going to be viewed by others in the creative industry, such as this? Have fun. I should note I’m actually a Flash developer, so my bias is in the complete opposite direction. But I still strongly value accessibility and standards. As a designer, you should too – if it’s appropriate and necessary. Wow. That was interesting – actually very cool but made me a little nauseous. I guess accessibility would be an issue – but really, if the audience is defined as the creative design industry, accessibility tends to take a back seat. Saw this site the other definitely pretty awesome. Very nice, but the load time killed me! smaller, the cooling effect is worse. We have been in CPU cooling principle, mentioned that the heat sink of cold air flowing through the heat is taken away, so the area of ? ?contact withhe air, the more the faster the rate of cooling.